Planning a weekend getaway? Chicago? St. Louis? Headed to Indianapolis for the Super Bowl? 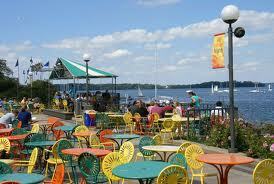 How about a stay-cation right here in Madison? Better yet, why not make it a beer weekend? A few years back, some beer bloggers got together and did a little exchange of ideas and recommendations about how to best spend a beer weekend in each of our respective hometowns. Well we’re at it again! Over the next few weeks, I’ll be posting our beer weekend getaways, which I’m guessing may inspire some mischief, maybe a bit of debauchery, and definitely some good times. I’ve tried to eliminate driving as much as possible, either through walking, public transport or by minimizing cab rides (and fares!). As always, be safe and responsible! So let’s kick off our series with home sweet home: welcome to Madison! There’s no better place to start off your beer weekend than the Wisconsin Memorial Union. The Union holds the prestigious position of being one of the only student unions in the country to serve beer an campus- and it just happens to have one amazing tap list! No worries about it being the student union- weekends are open to the public and Madisonians flock here every weekend to enjoy the tradition of the Rathskellar and the beauty of the terrace overlooking the lake. It really can’t be beat! 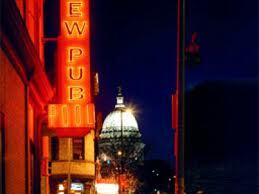 After the union, take a stroll or catch a bus up State Street to the Capitol Square for dinner at the Old Fashioned. Featuring traditional Wisconsin fare highlighting small Wisconsin producers and over 150 Wisconsin beers to choose from (the only beer on the import list? Bud Light), the Old Fashioned has become a must-do on any trip to Madison. Order up a flight, try the beer cheese soup, the best cheese curds in town and the traditional Wisconsin Friday night fish fry! Cooper’s Tavern: An Irish bar with a fantastic tap list. Grab the snug if you can and order your beer through a private window direct to the bar! If you’re ready for a snack, the poutine is awesome! 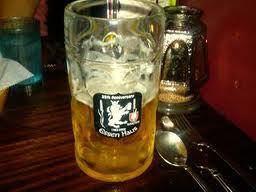 Genna’s: A Madison favorite with a great local tap beer list, a cozy atmosphere and one of the best jukeboxes in town. If it’s nice out, grab a seat on the patio. Tipsy Cow: The newest addition to Madison’s craft beer scene, the Tipsy Cow is well worth a stop and the name doesn’t get much more Wisconsin. Maduro: If you like your beer with a cigar, this is the place for you! 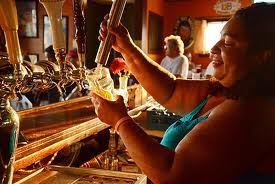 An added plus, the bartenders are very knowledgeable about beer. Bell’s is also prominently featured here, but there are plenty of others to choose from. Graze: Madison’s finest gastropub, serving up high-level pub fare with ingredients from local farms. As expected, the beer list is fantastic and if you have room for more food, I highly recommend the pork belly buns! Great Dane Pub & Brewing Co.: One of four Madison locations just happens to be right off the square and within easy walking distance. Don’t miss one of Madison’s oldest brewpubs! If you’re in Madison on the right weekend, you may be able to catch one of the Hop Head Beer Tours. This is no party bus though- the boys at Hop Head treat you to a fun and educational day of brewery visits, including beer experts serving as guest hosts on the bus, brewery tours and guided tastings lead by the brewers themselves. And the best part is, you don’t have to drive! 2. Take a road trip! The downside of this option is that driving is required, but it’s definitely worth it! Get the longest part of the drive out of the way first and head out to Potosi Brewing Company, one of the oldest breweries in the state and the site of the National Brewery Museum- definitely a must-visit. 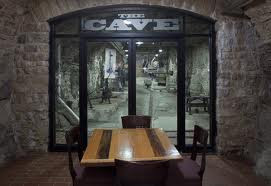 Some highlights (besides the beer, of course) include the hand-carved bar, the dining tables made from the original wooden beer vats and the beer cave. After that, head over to Monroe for a stop at the Minhas Brewery. I can’t say that the beer is my favorite, but as the oldest brewery in the state, the brewery’s history makes it well worth a visit. After Minhas, New Glarus Brewing is the next must-stop. One of the most acclaimed breweries in the country, this beer is only available in Wisconsin. The new brewery is brand-spanking new and beautiful. Better yet, so are the beers! (Don’t miss the Unplugged series!) The self-guided “tour” is not great: there are no signs explaining what you’re looking at, so unless you already know the brewing process and equipment, you probably won’t get much out of it. Don’t let that deter you though- there are Beer Ambassador’s on hand to answer any questions you have. The last stop on the road trip is the Grumpy Troll in Mt. Horeb. Grab a flight and a pizza and enjoy! If you’d like to stay in town and enjoy some more of the Madison beer scene, the #7 bus just happens to go by almost all of the best beer bars and restaurants in town! Do you think Madison Metro did that on purpose? Here’s the run down of options- if you want to hit them all, you’ll have to stick to a strict one-and-done rule though! But you may be better off just picking and choosing a few- you still have Saturday night to hit the Beermuda triangle! Glass Nickel Pizza Co.: If you started your day at Monte’s for breakfast, you’re conveniently already on the #7 route. Head a little farther east and start the crawl at the Glass Nickel Pizza Co- the tap list is excellent. The Harmony Bar: Head west at on the route to the Harmony Bar for the next awesome tap list! The Alchemy: Hike it one more block west on Atwood and you’ll run right into the Alchemy. More great beer! And if you’re hungry, great food too. Mickey’s: Head west on Williamson Street via bus or foot and continue on to the next great tap list! The Weary Traveler: Keep heading west on the #7 for the next excellent tap list. Play some Apples to Apples, a Wisconsin favorite, or another board game while you’re here! The Essen Haus: Hop off at E. Wilson Street to pass around a boot and get your polka on at Madison’s only traditional German beer hall! Big Ten Pub: Ride right past the Capitol Square, since you hit those bars Friday night and continue on to Regent Street where you’ll find the Big Ten Pub, which easily has the best tap list of the Camp Randall area bars. Great food too! Brasserie V: Next head up Monroe Street either by the #7 or by foot to Brasserie V for some awesome Belgian beers. Don’t forget- you’re in Wisconsin! Order the cheese plate while you’re here too. Jac’s: Jac’s is up next, if you’re still with me. A great tap list and, if you get the right bartender, maybe a beer cocktail? Vintage Brewing Company: Get off at the west side transfer point for our last stop on the #7 pub crawl and walk across the Copp’s parking lot to Vintage Brewing Company. Chosen as Wisconsin’s favorite brewpub last year by Madison Beer Review readers, you’ll find some of the best beer in town here. Also some of the most generous portion sizes from any menu in the city. If you aren’t completely beer’d out (and hopefully you’re not), head over to the Beermuda triangle Saturday night. Ale Asylum, the Malt House and Dexter’s pub make up this beer trifecta: start off at Ale Asylum, one of Madison’s most popular breweries, then get a cab over to Dexter’s Pub for another impressive tap list and some garlic chili fries (they’re so good!). The Malt House is just a short two block stroll from there and offers over 150 beers to choose from. Yummmm! Breakfast. Stat. My pick is the Hubbard Street Diner, which has fantastic food and just happens to be within easy walking distance of Capital Brewery, the last stop on our weekend tour. Catch the brewery tour or grab a beer in the beer garden, then relax and enjoy…. Then maybe extend your stay? 1. Go to a Mallards game! Madison’s local semi-pro baseball team also just happens to be one of the best beer outings in town- the Duck Blind! Not only do you get to get out, enjoy the Wisconsin summer and spend a night at a ball game, a ticket to the Great Dane Duck Blind also gets you an all-you-can-eat-and-drink pass to beer brats, burgers and beer, beer, beer. And not the typical Miller/Bud/water beer list you see at most ball parks either- here you get to choose from 20 different craft beers. Once the game is over, head over to Drackenberg’s- Madison’s only northside craft beer and cigar bar. It’s the perfect way to spend a summer evening! From June through September, there’s a beer festival almost every weekend- just pick a weekend! The granddaddy of them all is the Great Taste of the Midwest, easily one of the best beer festivals in the country (if not the best). Tickets can be hard to get, but they’re well worth it! If you’re going to be in town to get in line for Great Taste tickets, you should probably extend your stay and plan to hit a few events from Madison’s newest beer event, Madison Craft Beer Week. With a few hundred events to choose from, the challenge you’ll face is deciding which events you’ll have to miss! Hopefully you’ve found this guide helpful and informative. Obviously there are enough options here to make any beer geek happy, and I barely touched on the equally awesome food scene. If you’re going to be in town, let Madison Beer Review know- we’d love to know your plans and hear your feedback! Cheers!